Members of the Maine Legislature's Appropriations Committee listen to testemony during a public hearing at Jeff's Catering in Brewer on Monday. Members of the Maine Legislature's Appropriations Committee listen to testimony during a public hearing at Jeff's Catering in Brewer. Maine State Reps. Mike Carey (foreground left) and Peggy Rotundo walk past a group lead by the Maine People's Alliance expressing their opposition to the proposed budget cuts by Gov. Paul LePage at Jeff's Catering in Brewer on Tuesday. BREWER, Maine — More than one town leader called on the Legislature’s Appropriations and Financial Affairs Committee — in town Monday holding a special off-site public hearing about Gov. Paul LePage’s proposed $6.3 billion biennial budget — to create its own budget. These calls for action were intermixed with cries for help from small town and big city leaders who say the governor’s budget proposal, which includes a two-year suspension of municipal revenue sharing and major changes in the circuit breaker and homestead exemption property tax break, will hurt their residents and cause big cuts to services. Bangor area resident Cathy Day stood in front of the panel, which held a five-hour public hearing at Jeff’s Catering, and said she is worried about keeping her home. “It would require substantial layoffs across all departments,” Bangor City Councilor Joe Baldacci said when he testified. 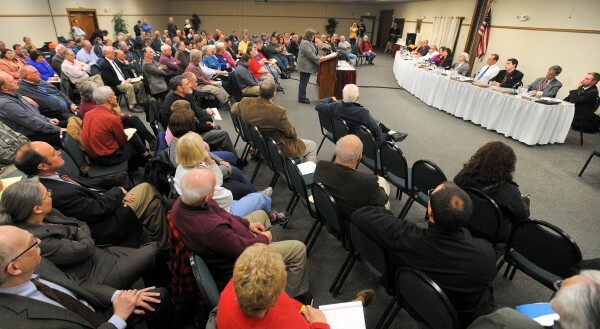 Bangor is a major service center for the state and would see major cuts, but make no mistake, small towns will also feel the pinch if the proposal goes forward, leaders from several communities told the visiting state budget panel. Sangerville Town Manager Dave Pearson stood before the panel and said it would have a “devastating impact” on his small town. Brownville Town Manager Matthew Pineo, the first to voice concerns about the proposed budget, estimates the changes would raise his community’s property tax by $2.96 per $1,000 valuation. Jon McLaughlin, executive director of the Southern Aroostook Development Corp., said the programs that the governor wants to cut or change “were designed to help municipalities or residents directly and have been on the books for years. “In one fell swoop to come in and eliminate [the programs] is not fair to the many citizens of this state,” McLaughlin said. Easton Town Manager Jim Gardner said his small community is not going to lie down and take it. “We fought TABOR [Taxpayer Bill of Rights] and now we’re fighting our own governor,” he said. Brewer Mayor Kevin O’Connell, who provided a copy of his statement to the Bangor Daily News, said he is skeptical when he hears that legislators will not let the budget the governor is offering go forward as proposed. Brewer would lose approximately $1.28 million, he said. “If the Legislature went one step further and reformed our tax code so that the effective tax rate for the most well-off citizens in our state was no more, but no less than that for the least well-off, you would be halfway again to shore,” he said. More than 200 spoke or watched during testimony that included local state representatives and senators, municipal leaders from Brewer, Bangor, Bucksport, Orrington, Tremont and area residents. 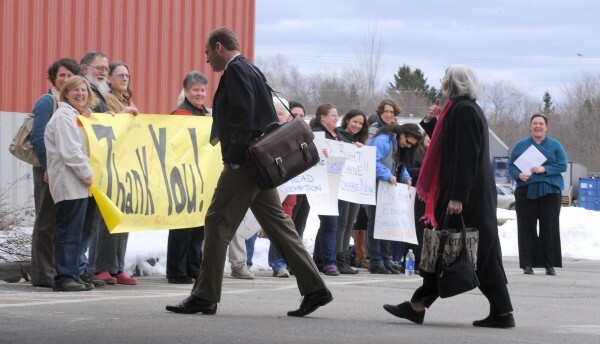 A group of people, led by the Maine People’s Alliance, a public advocacy organization, protested the governor’s proposed budget, with signs that read “My family relies on Homestead Exemption” and “Fair Share Now.” They stood out front and greeted those who entered. One yelled, “Thank you for coming to Brewer” as members of the appropriations committee entered the building. Rep. Aaron Frey, a Democrat who represents Bangor, Veazie and part of Orono and is a member of the appropriations committee, said it was nice that the committee visited the area to get public comment from locals, many of whom work during the day. He and state Sen. Emily Cain, D-Orono, said before the hearing started that they have heard from people from all over the state who are upset about the governor’s budget proposal. “Week after week we hear that Maine people want alternatives — they don’t want the budget balanced on the backs of working families, seniors and small-business owners,” Frey said. David Sorensen, communications director for the Maine House Republicans, pointed to Bucksport’s exploration of cutting municipal department budgets by 15 percent as an example of how municipalities could adapt to the reduced availability of state aid. 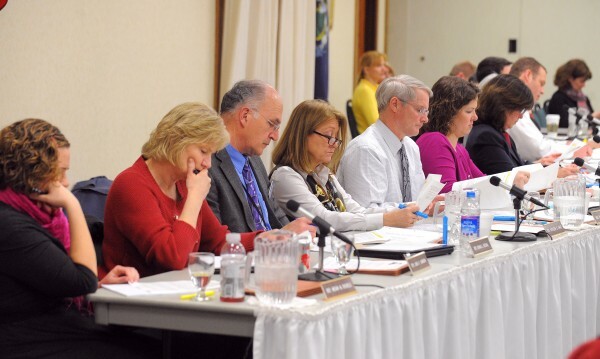 The Appropriations Committee has been holding hearings in the State House with other legislative committees on the biennial budget, which LePage’s commissioners released on Jan. 11. The Appropriations Committee will make adjustments to LePage’s budget, then send its recommendations to the full Legislature and the governor for approval. Houlton Town Manager Eugene Conlogue, who said the proposed budget would have a “huge impact” on the Aroostook County town, was the first to suggest the appropriations committee come up with a budget that Mainers can live with. “The committee should set aside this budget and create their own,” he said. BDN reporter Robert Long contributed to this story.